The Free State of Saxony (German: der Freistaat Sachsen [ˈfʁaɪ̯ʃtaːt ˈzaksn̩]; Upper Sorbian: Swobodny stat Sakska) is a landlocked federal state of Germany, bordering the federal states of Brandenburg, Saxony Anhalt, Thuringia, and Bavaria, as well as the countries of Poland (Lower Silesian and Lubusz Voivodeships) and the Czech Republic (Karlovy Vary, Liberec and Ústí nad Labem Regions). Its capital is Dresden, and its largest city is Leipzig. Between 1990 and 2008, Saxony was divided into the three regions (Regierungsbezirke) of Chemnitz, Dresden and Leipzig. After a reform in 2008, these regions - with some alterations of their respective areas - were called Direktionsbezirke. In 2012, the authorities of these regions were merged into one central authority, the Landesdirektion Sachsen. The Erzgebirgskreis district includes the Ore Mountains, and the Schweiz-Osterzgebirge district includes Saxon Switzerland and the Eastern Ore Mountains. The largest cities in Saxony according to the 31 December 2015 estimate. To this can be added that Leipzig forms a metropolitan like region with Halle, known as Ballungsraum Leipzig/Halle. 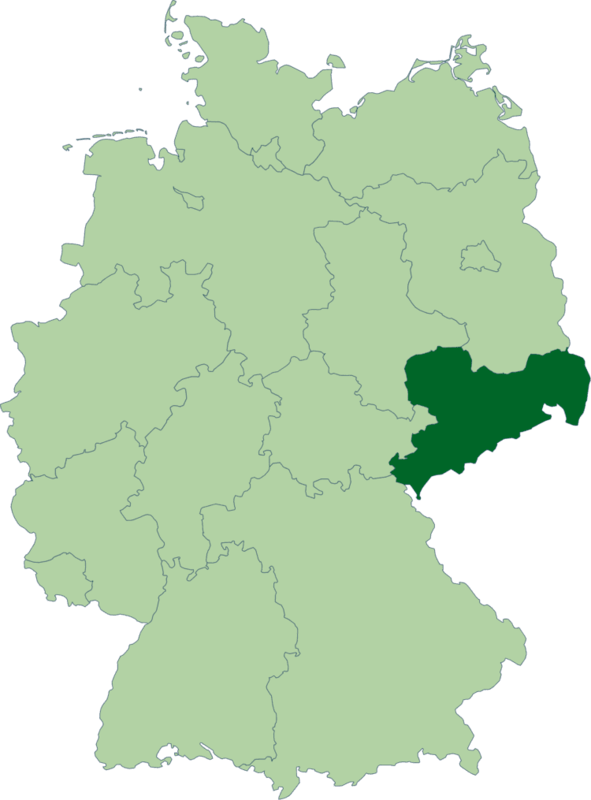 The latter city is located just across the border to Saxony-Anhalt. Leipzig shares for instance an S-train system (known as S-Bahn Mitteldeutschland) and an airport with Halle. Saxony has, after Saxony Anhalt, the most vibrant economy of the states of the former East Germany (GDR). Its economy grew by 1.9% in 2010. Nonetheless, unemployment remains above the German average. The eastern part of Germany, excluding Berlin, qualifies as an "Objective 1" development-region within the European Union, and is eligible to receive investment subsidies of up to 30% until 2013. FutureSAX, a business plan competition and entrepreneurial support organisation, has been in operation since 2002. Microchip makers near Dresden have given the region the nickname "Silicon Saxony". The publishing and porcelain industries of the region are well known, although their contributions to the regional economy are no longer significant. Today the automobile industry, machinery production and services contribute to the economic development of the region. 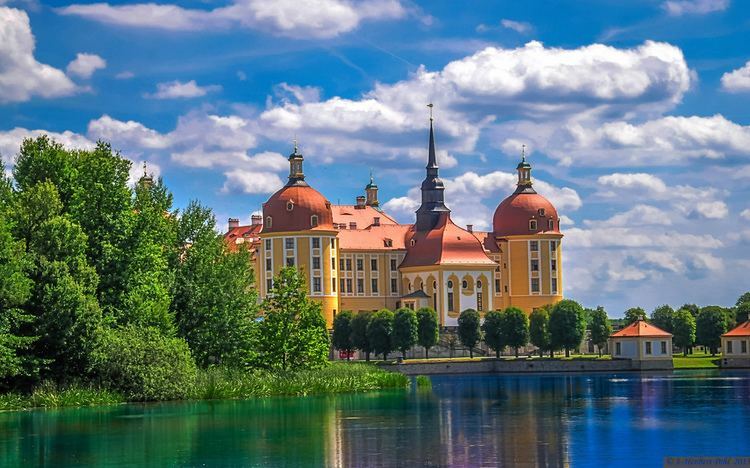 Saxony is also one of the most renowned tourist destinations in Germany - especially the cities of Leipzig and Dresden and their surroundings. New tourist destinations are developing, notably in the lake district of Lausitz. 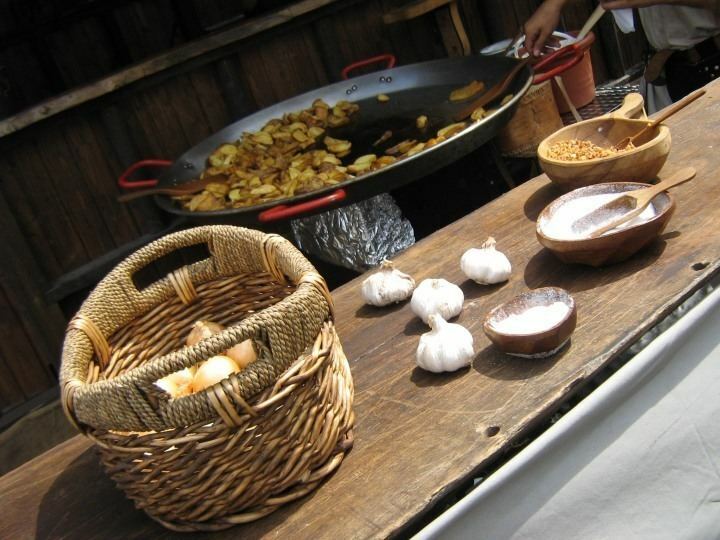 Saxony reported an average unemployment of 8.8% in 2014. By comparison the average in the former GDR was 9.8% and 6.7% for Germany overall. The unemployment rate reached 8.2% in May 2015 (6.3% for all of Germany). The Leipzig area, which until recently was among the regions with the highest unemployment rate, could benefit greatly from investments by Porsche and BMW. With the VW Phaeton factory in Dresden, and many part suppliers, the automobile industry has again become one of the pillars of Saxon industry, as it was in the early 20th century. Zwickau is another major Volkswagen location. Freiberg, a former mining town, has emerged as a foremost location for solar technology. Dresden and some other regions of Saxony play a leading role in some areas of international biotechnology, such as electronic bioengineering. While these high-technology sectors do not yet offer a large number of jobs, they have stopped or even reversed the brain drain that was occurring until the early 2000s in many parts of Saxony. Regional universities have strengthened their positions by partnering with local industries. Unlike smaller towns, Dresden and Leipzig in the past experienced significant population growth. The average number of children per woman in Saxony was 1.49 in 2010, the highest of all German states. In 2014, the value reached 1.57. Within Saxony, the highest is the Bautzen district with 1.77, while Leipzig is the lowest with 1.49. Dresden's birth rate of 1.58 is the highest of all German cities with more than 500,000 inhabitants. In prehistoric times, the territory of Saxony was the site of some of the largest of the ancient central European monumental temples, dating from the 5th century BC. Notable archaeological sites have been discovered in Dresden and the villages of Eythra and Zwenkau near Leipzig. 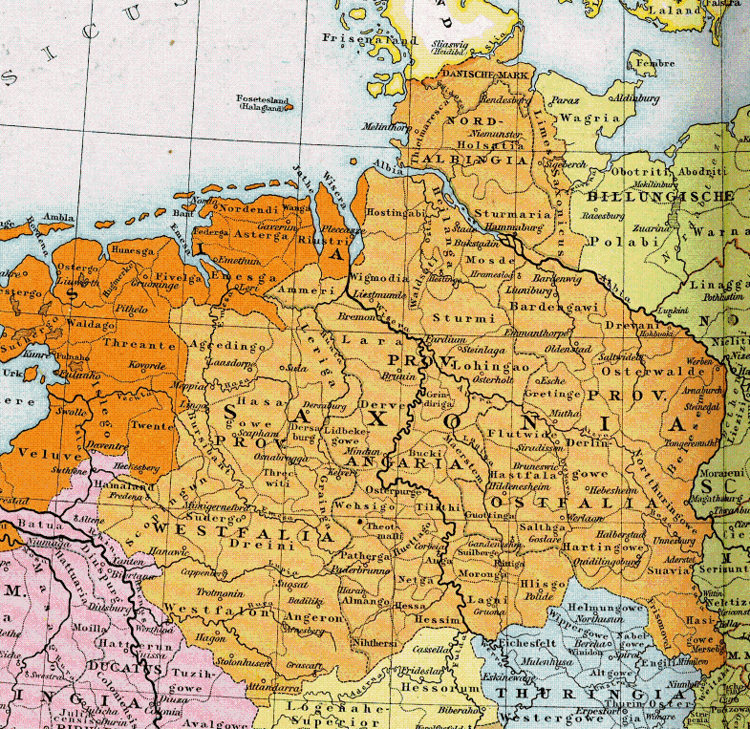 The Slavic and Germanic presence in the territory of today's Saxony is thought to have begun in the 1st century BC. Parts of Saxony were possibly under the control of the Germanic King Marobod during the Roman era. By the late Roman period, several tribes known as the Saxons emerged, from which the subsequent state(s) draw their name. For the origins of the Saxon tribes, see Saxons. After King Frederick Augustus III of Saxony abdicated on 13 November 1918, Saxony, remaining a constituent state of Germany (Weimar Republic), became the Free State of Saxony under a new constitution enacted on 1 November 1920. In October 1923 the federal government under Chancellor Gustav Stresemann overthrew the legally elected SPD-Communist coalition government of Saxony. The state maintained its name and borders during the Nazi era as a Gau, but lost its quasi-autonomous status and its parliamentary democracy. As World War II drew to its end, U.S. troops under General George Patton occupied the western part of Saxony in April 1945, while Soviet troops occupied the eastern part. That summer, the entire state was handed over to Soviet forces as agreed in the London Protocol of September 1944. Britain, the USA, and the USSR then negotiated Germany's future at the Potsdam Conference. Under the Potsdam Agreement, all German territory East of the Oder-Neisse line was annexed by Poland and the Soviet Union, and, unlike in the aftermath of World War I, the annexing powers were allowed to expel the inhabitants. During the following three years, Poland and Czechoslovakia forcibly expelled German-speaking people from their territories, and some of these expellees came to Saxony. Only a small area of Saxony lying east of the Neisse River and centred around the town of Reichenau (now called Bogatynia), was annexed by Poland. The Soviet Military Administration in Germany (SVAG) merged that very small part of the Prussian province of Lower Silesia that remained in Germany with Saxony. The German Democratic Republic (East Germany), including Saxony, was established in 1949 out of the Soviet zone of Occupied Germany, becoming a constitutionally socialist state, part of COMECON and the Warsaw Pact, under the leadership of the SED. In 1952 the government abolished the Free State of Saxony, and divided its territory into three Bezirke: Leipzig, Dresden, and Karl-Marx-Stadt (formerly and currently Chemnitz). Also areas around Hoyerswerda was part of Cottbus one. The Free State of Saxony was reconstituted with slightly altered borders in 1990, following German reunification. Besides the formerly Silesian area of Saxony, which was mostly included in the territory of the new Saxony, the free state gained further areas north of Leipzig that had belonged to Saxony-Anhalt until 1952. Saxony has traditionally been predominantly Protestant (though the monarchs of the Saxon Kingdom themselves were Catholic as an ancestral relic of being Kings of Poland), but after World War II and 40 years of Communist rule, the majority of the population has become secular. In 1925, 90.3% of the Saxon population was Protestant, 3.6% was Roman Catholic, 0.4% was Jewish and 5.7% was placed in other religious categories. As of 2011, the Evangelical Church in Germany represented the largest faith in the state, adhered to by 21.4% of the population. Members of the Roman Catholic Church formed a minority of 3.8%. About 0.9% of the Saxons belonged to an Evangelical free church (Evangelische Freikirche, i.e. various Protestants outside the EKD), 0.3% to Orthodox churches and 1% to other religious communities, while 72.6% did not belong to any public-law religious society. A minister-president heads the government of Saxony. Stanislaw Tillich has been minister-president since 28 May 2008. See: List of Ministers-President of Saxony, for a full listing.